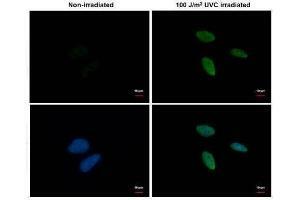 ICC/IF Image Chk1 (phospho Ser345) antibody [C1C2], Internal detects Chk1 (phospho Ser345) protein at nucleus by immunofluorescent analysis. Samples: HeLa cells mock (left) and UVC treated with 100J/m2 and recover for 8hr (right) were fixed in 4% paraformaldehyde at RT for 15 min. 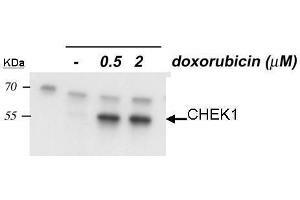 Green: CHK1 (phospho Ser345) protein stained by Chk1 (phospho Ser345) antibody [C1C2], Internal , diluted at 1:500. Blue: Hoechst 33342 staining. 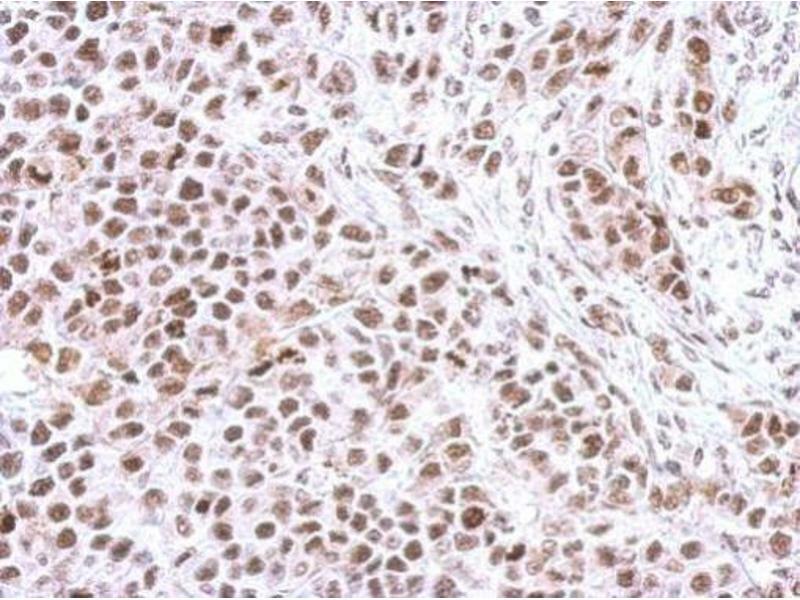 IHC-P Image Immunohistochemical analysis of paraffin-embedded HeLa xenograft, using Chk1 (phospho Ser345) , antibody at 1:500 dilution. 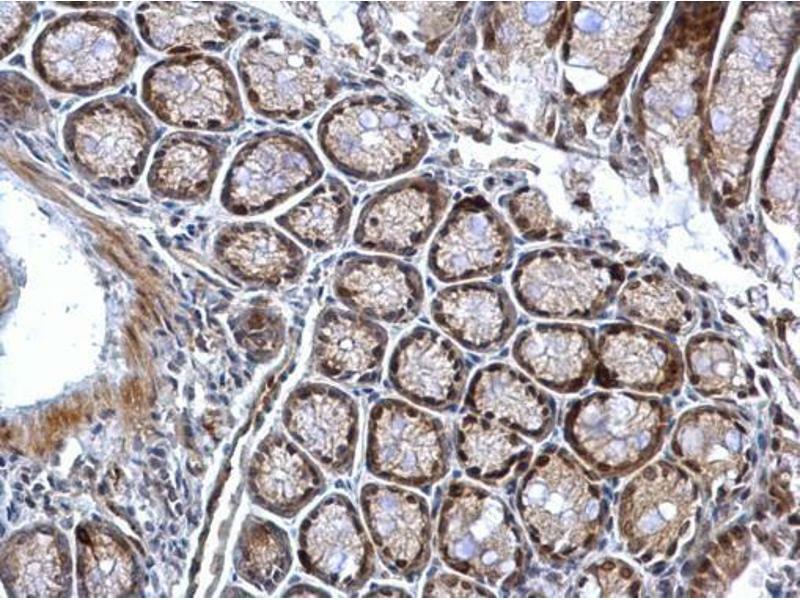 IHC-P Image Chk1 (phospho Ser345) antibody [C1C2], Internal detects Chk1 (phospho Ser345) protein at nucleus on mouse colon by immunohistochemical analysis. 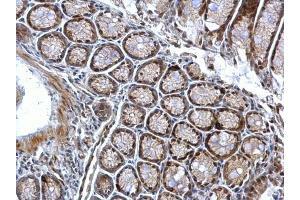 Sample: Paraffin-embedded mouse colon. 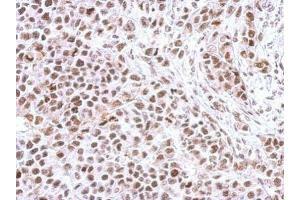 Chk1 (phospho Ser345) antibody [C1C2], Internal , dilution: 1:500. Background Required for checkpoint mediated cell cycle arrest in response to DNA damage or the presence of unreplicated DNA. 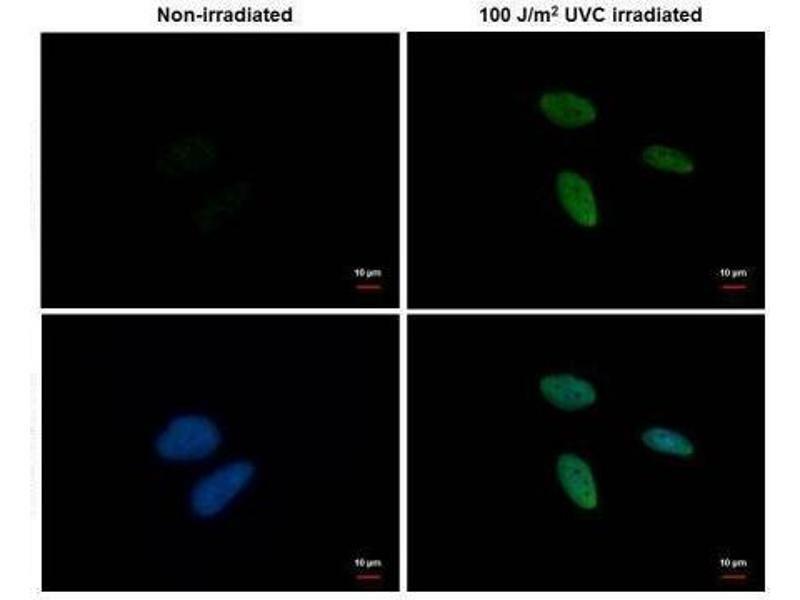 May also negatively regulate cell cycle progression during unperturbed cell cycles. Recognizes the substrate consensus sequence [R-X-X-S/T]. Binds to and phosphorylates CDC25A, CDC25B and CDC25C. Phosphorylation of CDC25A at 'Ser-178' and 'Thr-507' and phosphorylation of CDC25C at 'Ser-216' creates binding sites for 14-3-3 proteins which inhibit CDC25A and CDC25C. Phosphorylation of CDC25A at 'Ser-76', 'Ser-124', 'Ser-178', 'Ser-279' and 'Ser-293' promotes proteolysis of CDC25A. 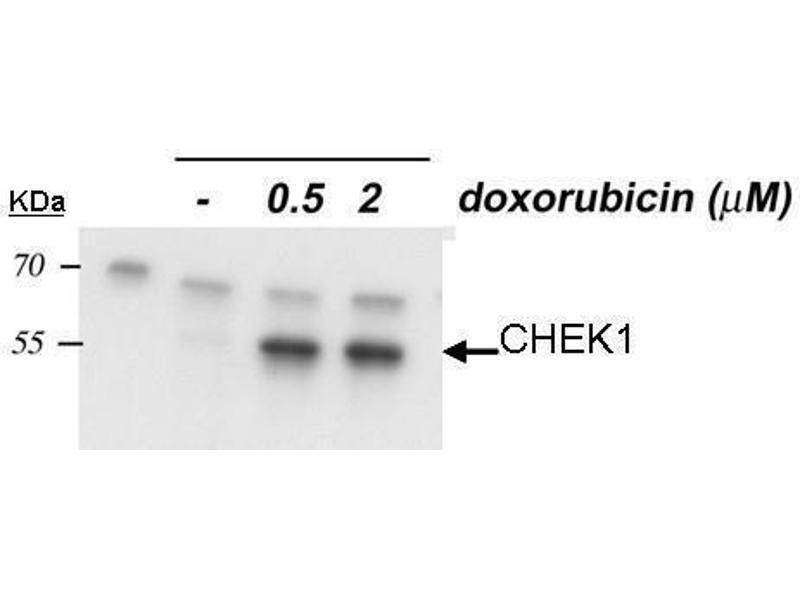 Inhibition of CDC25 activity leads to increased inhibitory tyrosine phosphorylation of CDK-cyclin complexes and blocks cell cycle progression. Binds to and phosphorylates RAD51 at 'Thr-309', which may enhance the association of RAD51 with chromatin and promote DNA repair by homologous recombination. Binds to and phosphorylates TLK1 at 'Ser-743', which prevents the TLK1-dependent phosphorylation of the chromatin assembly factor ASF1A. This may affect chromatin assembly during S phase or DNA repair. May also phosphorylate multiple sites within the C-terminus of TP53, which promotes activation of TP53 by acetylation and enhances suppression of cellular proliferation.